Jean Best, of the Rotary Club of Kirkcudbright, Dumfries and gallowayScotland: “Without peace within ourselves we will never advance global peace,” said Best, explaining The Peace Project, the program she created to help “the future leaders of peace” develop the skills they need to resolve the conflicts in their lives. Taylor Cass Talbot, Rotary Peace Fellow: Currently based in Portland, Oregon, USA, Cass Talbot partnered with SWaCH, a waste-picker cooperative in India to form Pushing for Peace, which promotes safety, sanitation, and dignity for waste pickers in Pune, India. Her advocacy displays an artistic flair: her Live Debris project creatively addresses issues of waste on a global scale. 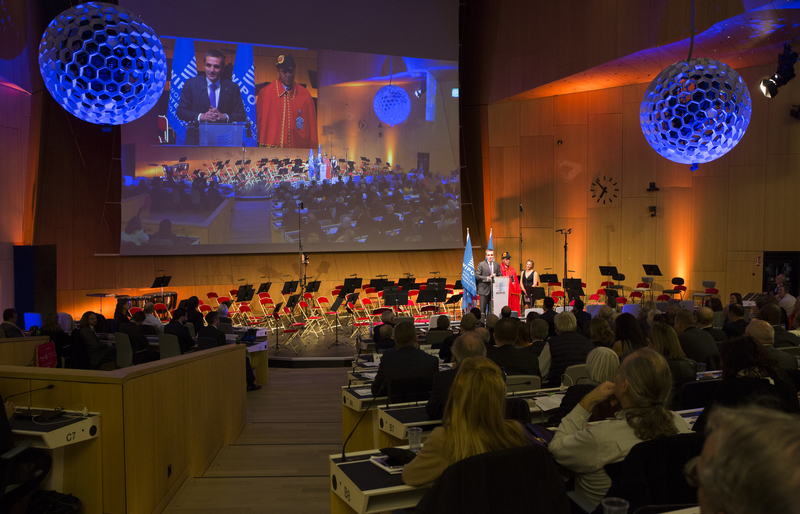 Watch the opening session of Rotary UN Day including remarks by the 2017 People of Action: Champions of Peace. Rotary Champion of Peace Kiran Singh Sirah speaks at the United Nations. More than 1,200 people from around the world attended Rotary Day at the United Nations. A workshop created by and for young leaders explored education and science as a pathway to peace. Rotary Day at the UN focused on peace. “This same international relationship (that’s eradicating polio) can be used to achieve world peace," said Dr. Michel Zaffran, the director of polio eradication at the World Health Organization. Rotaractors from around the world helped organize workshops on peace, education, and science. More than one-third of the attendees were under the age of 35. Rotary International President Ian H.S. Riseley and his wife, Juliet, listen to speeches. "It is past time for all of us to recognize the potential of all of our Rotary service to build peace, and approach that service with peacebuilding in mind,” Riseley said in his keynote speech. “Throughout Rotary’s history we’ve proven that you don’t need to be a diplomat to build peace,” said Paul A. Netzel, trustee chair of The Rotary Foundation. Rotary champions of peace Taylor (Stevenson) Cass Talbott, middle, and Safina Rahman. Rotary Day at the United Nations came to an end on the 99th anniversary of the 11th hour of the 11th day of the 11th month that signaled the end of World War I.